In 1976, Vernon McFarland perfected a new way to prepare chicken - with a special marinade and breading that created an entirely unique product. Mr. McFarland then opened the first Rex's Chicken restaurant in McAlester, Oklahoma. So, into a fast food world of legs, wings, and drumsticks- he chose to serve 100% boneless breast of chicken before any other restaurant in America. The upstart boneless chicken restaurant grew to over 35 locations between 1976-1992. 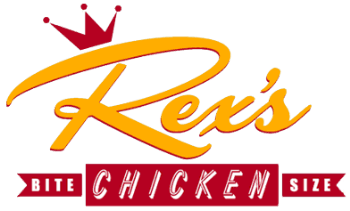 Rex's Chicken Franchise System was founded in 2007 with the sole purpose of carrying on Vernon McFarland's vision of serving the freshest chicken, frybread, and homestyle sides at locations across the United States. Loads of juicy, lightly-breaded chicken served with choice of homemade sides- all served with fresh, hot Rex’s famous frybread and honey. Bite-sized chicken but King-sized opportunity! As a Rex's Chicken franchisee, you get a unique and proven menu built around a fine-tuned system. Ask about catering and delivery !